Here's a little trick for Halloween. This image started with a photo I took several weeks ago. I was sitting in the car at Long Hill Gardens waiting for my daughter, who was picking up our farm share. It was pouring rain. I looked at the house nearby. (Which house? A little yellow farmhouse that is part of Long Hill Gardens.) I noticed that through the rain on the windshield, all the lines of the siding were distorted and kind of swirly, so I took a couple of pictures. Since it is October 31, I decided to make this into a Witch House. So I opened the image in Painter and put a dark color overlay over the sky. 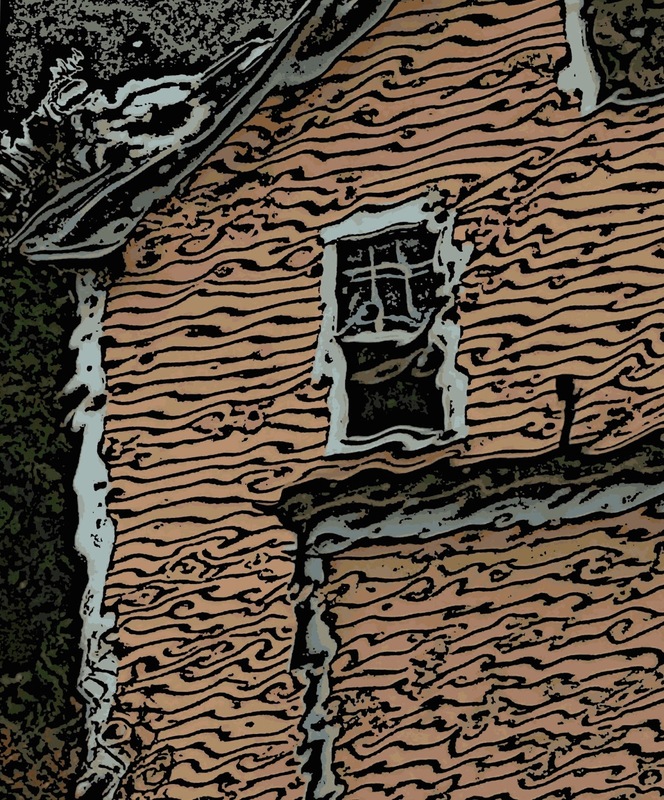 Then I added a digital woodcut effect. After that, I adjusted the hue to turn the siding from charming yellow to pumpkin orange. To finish the image, I pumped up the saturation and then cropped it to get this composition. I put some extra time into this painting today because I need to finish it by tomorrow. (I am submitting it for a show.) This is oil bar on a small canvas (8 x 10 inches). I am working from a photo that I took at Long Hill Gardens, here in Beverly, MA. (My reference photo is posted here, October 18.) So this morning, I started by mixing up some warmer shades of green, using a warm blue, and worked on the leaves, painting in missing leaves and brightening leaves that were already painted in. Then I used some dark red-violet to paint shadows on the apples and on the leaves. Finally, I painted in the sunlight (background) with pale yellow. The composition and colors are pretty much there. Tomorrow I plan to clean up some of the lines and fix little mistakes. Almost done. . . Here is the painting I am working on. I am painting these apples from a photo that I took at Long Hill Gardens recently. (My reference photo is posted here, on October 18.) This is oil bar on a small canvas, 8 x 10 inches. Today I started by toning down the yellow highlights with some white, to make it look more like sunlight through branches. Then I went back to the "tomato red" I started with, and stumbled it over the apples, to brighten them up. And I added some pink and white highlights to the apples. Then I mixed up some yellow-green and some more leaves to the painting. To be continued. . . . This morning I did some more work on this painting. 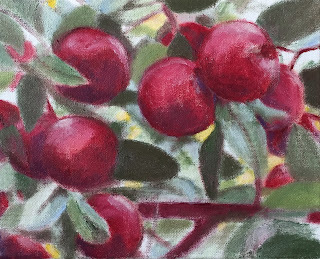 This is oil bar on a small canvas (8 x 10 inch) and the subject is an apple tree that I photographed earlier this fall. (My reference photo is posted on this site, October 18.) Today I began by going over the the darkest leaves with a deep green, and while I was at it, did a little work defining shapes of the rest of the leaves. While I was looking at my reference photo, I discovered a couple more apples lurking in the shadows, so I added them to the painting. I also noticed the suggestion of a branch, so I put that in as well. Then I mixed some blue into my darkest red and created deeper shadows on the apples. To be continued. . . . I worked on this painting of apples again this morning, using one of my photos as a reference (posted here on October 18.) This is oil bar on a small canvas (8 x 10 inches). Today I started with the task of painting in the lightest leaves. I also did some work on the apples and branches. Even though I am still working out the placement of some of the leaves, this is coming together and I am hoping to finish it this week. This is the oil bar painting I am working on. I am painting from a photo of an apple tree that I took recently at Long Hill Gardens, here in Beverly, MA. (The reference photo is posted here on October 18.) This morning I decided to figure out where the brightest spots in the painting should be. I used bright yellow to indicate where sunlight is breaking through the branches, and pale blue to indicate where bright sunlight is hitting the leaves. (These are not the final colors; I exaggerate the colors so I can see where I am. Later I plan to replace the bright yellow with a very pale yellow, nearly white. And the pale blue will become a very pale blue-green. I worked on this painting for a while this morning. 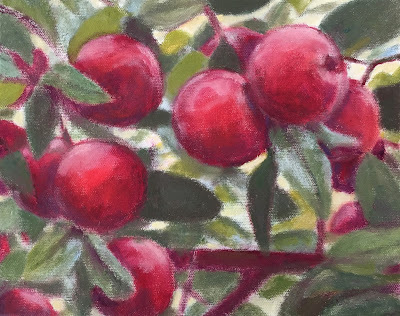 I am painting some apples on a tree branch, working from a photo that I took recently at Long Hill Gardens, here in Beverly, MA. (My reference photo is posted here, October 18, 2015.) Today I started by adjusting the position of the apples just a bit. 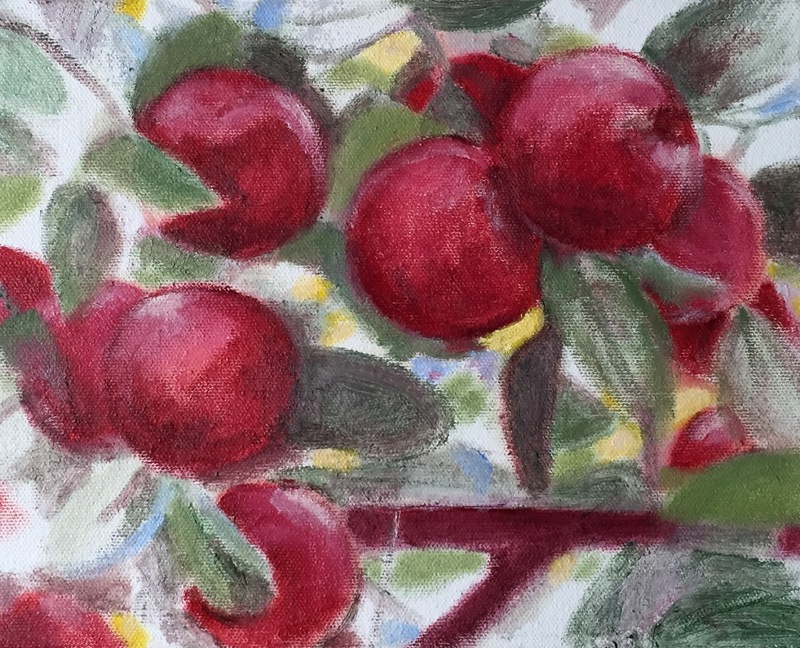 I mixed up some dark red-violet to contrast with what I already had painted (so I could see what I was doing) and used it to redraw the outlines of the apples. Then I used the rest of it to add more shadows to the apples and to darken the tree branch. 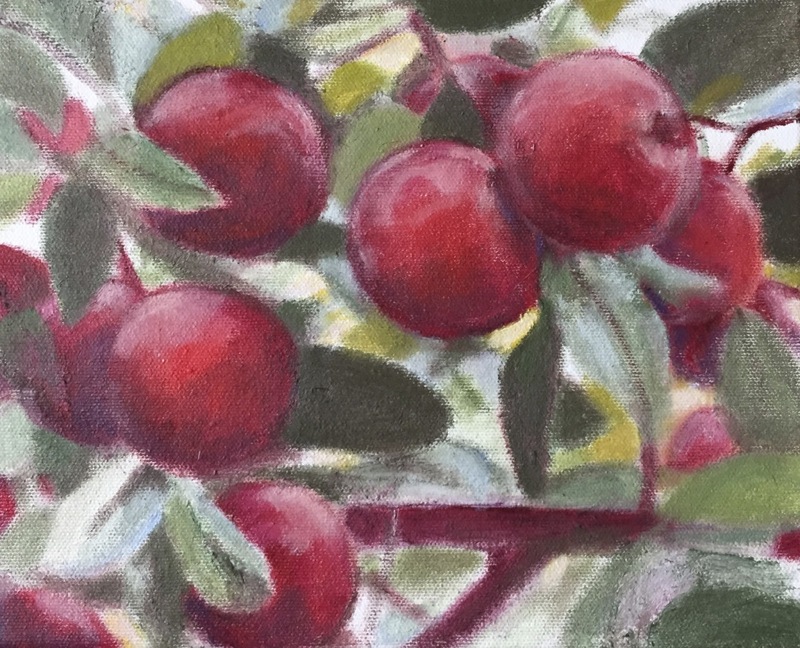 I also used some darker green on the leaves around the apples, to help define the new position of the apples, and then used the rest of it to add more shadows and more leaves. This is a small (8 x 10 inch) oil bar painting that I am working on, using one of my photos as a reference. (I took the photo at Long Hill Gardens, and it is posted here on October 18.) This morning I started added some dark areas, using some darker green to figure out where I want the leaves (and stems) to go. I think I may still adjust the position of the apples. I am not sure yet. But I am sure that I love to paint. This afternoon, I worked on this painting. This is oil bar on a small canvas (8 x 10 inches), and I am working from a photo that I took at Long Hill Gardens. (My reference photo is published here, October 18.) Today, I had already decided I wanted to adjust the placement of the apples, so that is what I concentrated on. In the process, I made the red darker (and bluer.) I also started to add a few highlights, and put in a few more leaves. I was short on time again today, but I worked on this painting for a while. This is oil bar on a small (8 x 10 inch) canvas. This painting is based on one of my photos, posted here October 18. I am still working on establishing the composition. I added more leaves and stems, but the biggest change was moving the branch so that it is lower on the canvas. I used purple for the branch and to add the beginnings of some shadows on the apples. I worked on this painting for a short time this morning. This is oil bars on canvas; I am working from a photo that I took recently at Long Hill Gardens (posted here October 18.) This morning I wanted to adjust the placement of the apples. So I could see what I was doing, I used a different color of red, and this color is also a bit closer to what I want for these apples. I mixed up a little more grayish green just to cover up the lines I do not want to keep. Today I cropped this image from a photo that I posted here a few weeks ago (October 2nd). 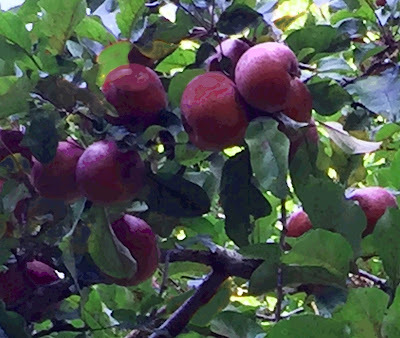 This is a picture of apples on the branch from pictures I took of apple trees at Long Hill Garden. 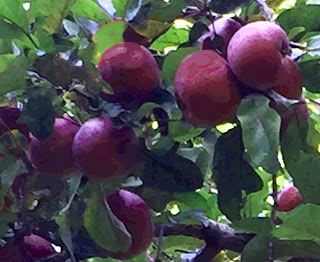 I am planning to use that photo as a reference for painting, but I cropped the original to focus on the apples and get a tighter composition. Because I want to use this for a series I am working on (paintings of branches done on small canvases), I also used Painter to resize the image so I could print out an 8 x 10 inch copy, the size of the canvas I plan to use. I started this little digital drawing five days ago, as a five-minute drawing exercise. (I have been using Painter's digital pastel.) Tonight's five minutes (plus) that brought this to nearly half an hour. But I wanted to make the lights and darks consistent in the foliage. Now I think this is done, though I may clean it up a bit because I am thinking of using it for a Thanksgiving card. This is the 5-minute drawing that I started a few days ago, using Painter's digital pastel. I have been doing an additional 5 minutes a night, so this is now a 20 minute drawing. This is basically done, apart from a bit of cleanup, which should only take a few minutes. . . .
My schedule has been nuts, so a couple of days ago, but the sign says "Art Every Day", and I decided to do a timed drawing for five minutes. So I started this digital drawing in Painter, using digital pastel. Yesterday I worked on it for another five minutes, but I still wanted to do more. So tonight I worked on it again, correcting mistakes, changing the color of the sky, and adding a bit more detail. I got lost in the drawing so it was probably more like seven or eight minutes. Anyway, I had fun and I like the drawing although I am worried about added too much detail. But I am planning to risk that tomorrow by putting in another five minutes. Tonight I decided to do another five minutes on the five-minute drawing that I started yesterday. This is where I was when time was up. 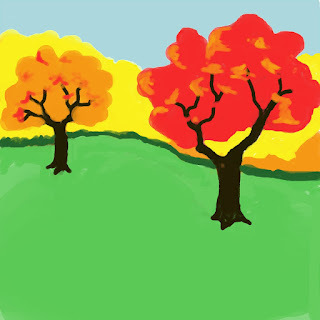 I am working with Painter's digital pastel. I think I could use another five minutes. . . .tomorrow. I have been taking lots of photos, and fall is the perfect time for that around here. But today I wanted to draw or paint, and it has been too long. I have lots of "good reasons": tons of work, home studio turned upside-down to install new windows and new lights, and a long-running cough that has kept me away from paint and pastel. 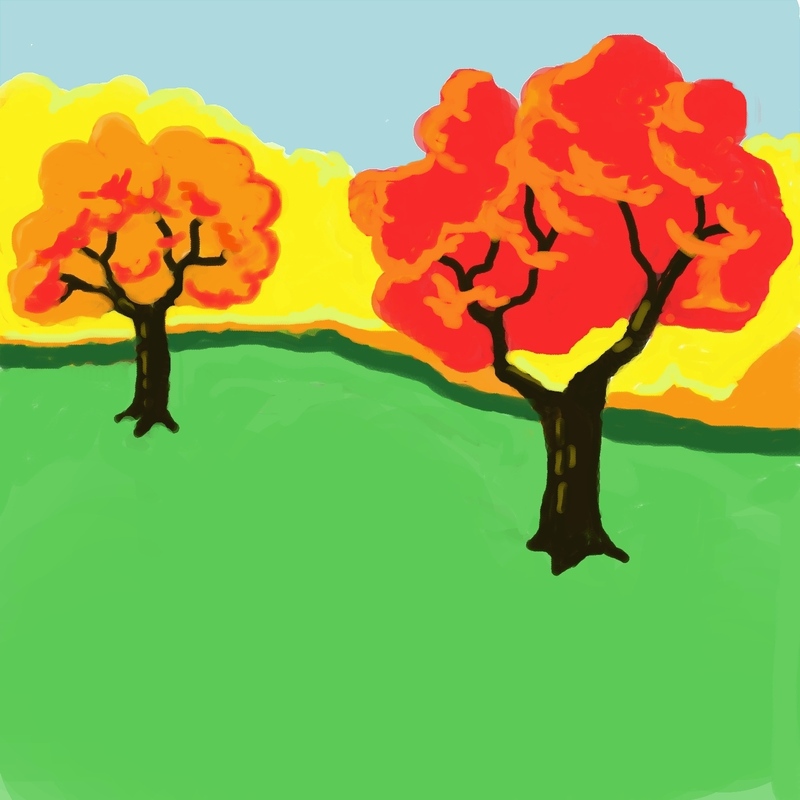 But I would rather make art than excuses, so tonight I decided to do a timed drawing for just five minutes, using Painter's digital pastel. (No cleanup, no coughing!) This is as far as I got in five minutes and change. I may do another five minutes on it tomorrow. Here's another photo from the farmshare pickup at our CSA. (The Food Project, pick up at Long Hill Gardens.) This is a photo of kale in a red basket. I was taking photos and holding the dog's leash at the same time (can you tell)? The dog has little patience for photography, so it's amazing that I got any photos at all. No worries, I can do a lot of repair with iPhoto and Painter. I was going to straighten and crop this one into a clean square, just kale. But I decided that I liked the red basket and the quirky composition, so here it is, just as it came out of the iPhone. 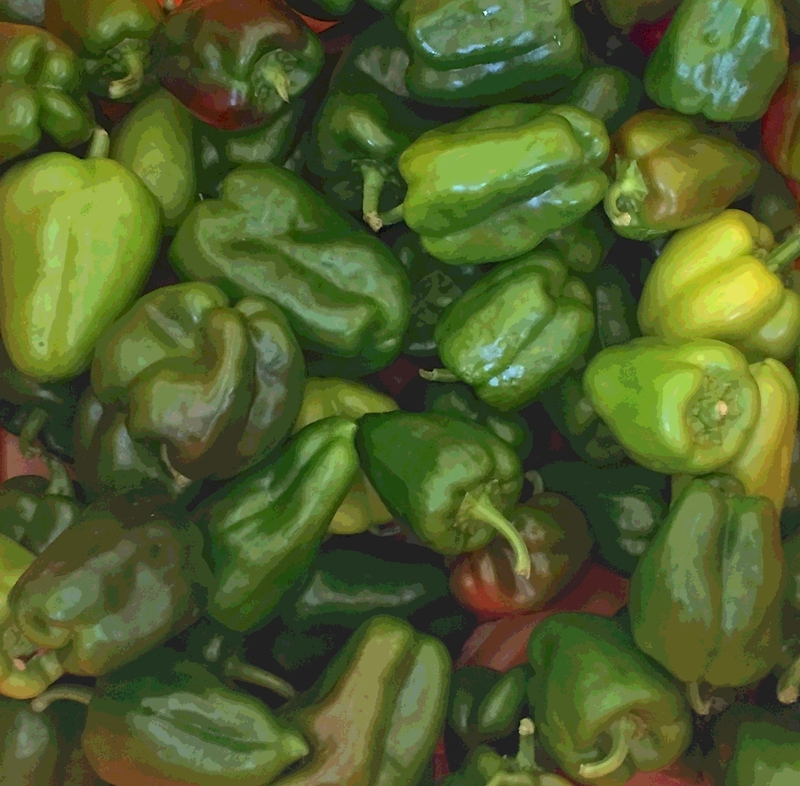 Here's one last look at my photo of green and red peppers, taken last week over at the Food Project's farmshare pickup at Long Hill Gardens. 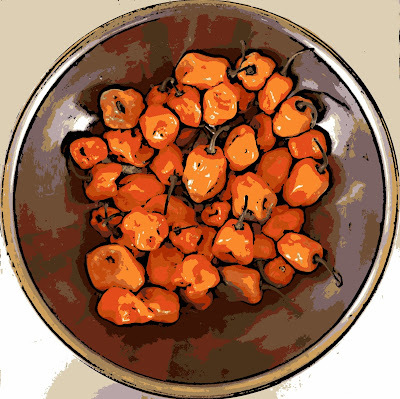 I used Painter to put a little woodcut effect on these peppers, which makes them look like they have been charred on the grill. Here is another version of my photo of red and green peppers, taken last week at our CSA pickup. I used Painter to add posterizing, which flattens and simplifies shape and heightens color (making the image look like a poster, I guess). I might use this as an illustration for our food blog at some point. This image started with another photo that I took last week when we went to pick up our farmshare at The Food Project, which distributes at Long Hill Gardens. There was a big old orange bin full of peppers, mostly green but some red. Tonight I cropped this image out of the original photo and did a little retouching in iPhoto. 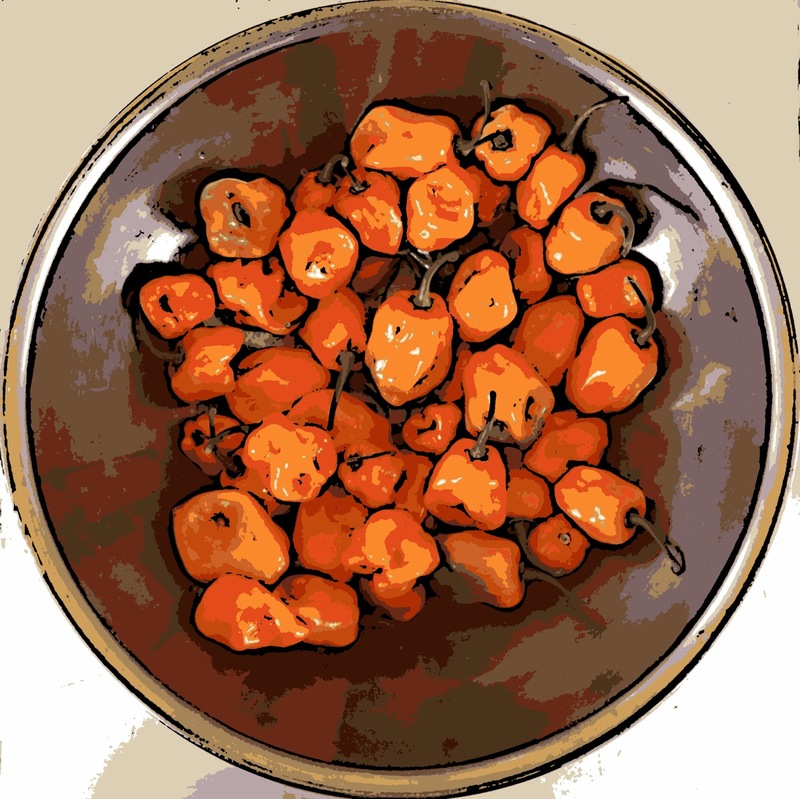 I like taking photos of fruits and vegetables, and sometimes these photos turn up as illustrations on our food blog. This is the third (and last) version of this image. This began with a bowl of habaneros that I photographed last week at The Food Project (our CSA). I had to edit and simplify the background so that I could square the circle. Yesterday I published the posterized version. 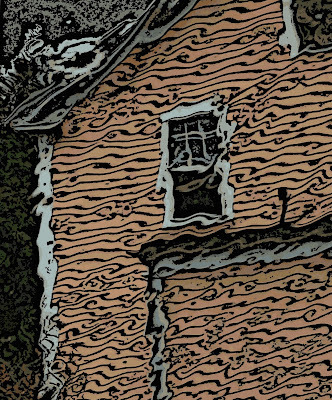 I created tonight's version with Painter's woodcut effect. I think I like this version best. 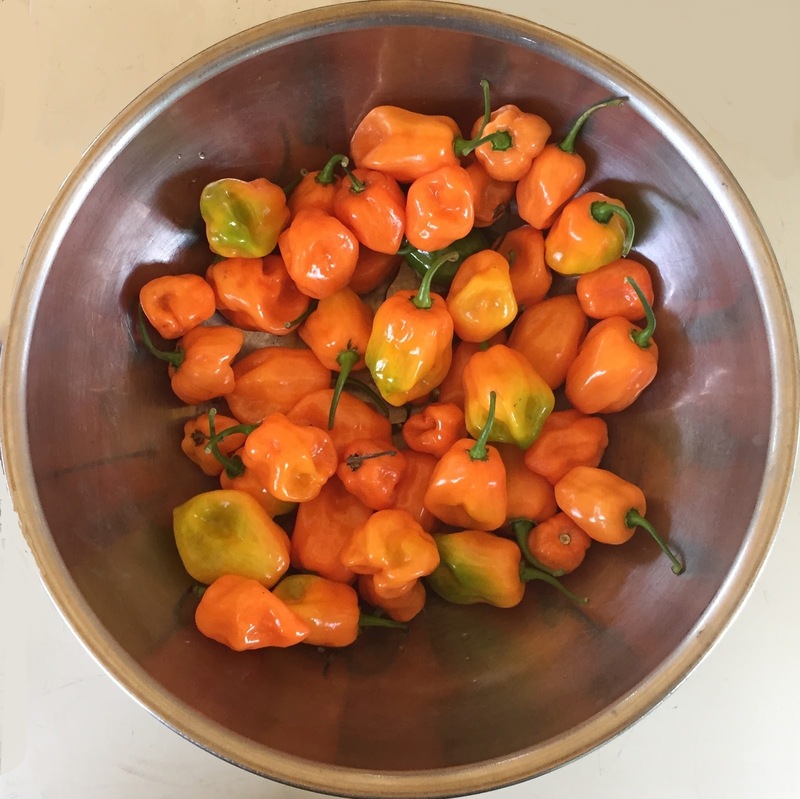 Yesterday I posted a photo of a bowl of habanero peppers. I took the original photo at Long Hill Gardens during a pick up for our CSA, The Food Project. I edited the original photo to simplify the background and cropped the image to square the circle. Tonight's post is another version of the same image, this time with Painter's posterized effect added. Every week, we pick up our farm share at the Food Project, which distributes at Long Hill Garden. This week, I had a chance to take some pictures. I got a nice overhead shot of this bowl of habanero peppers. For this composition, I decided to square the circle, but there were some distractions in the background, so tonight I used Painter's digital pastel to make a simplified background. 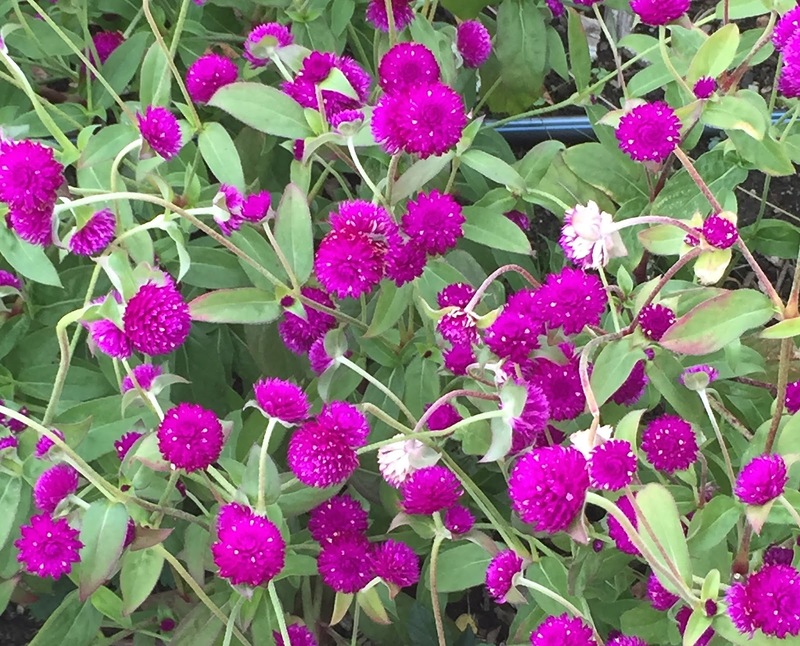 Here's another photo of flowers from last week's trip to Long Hill Garden. 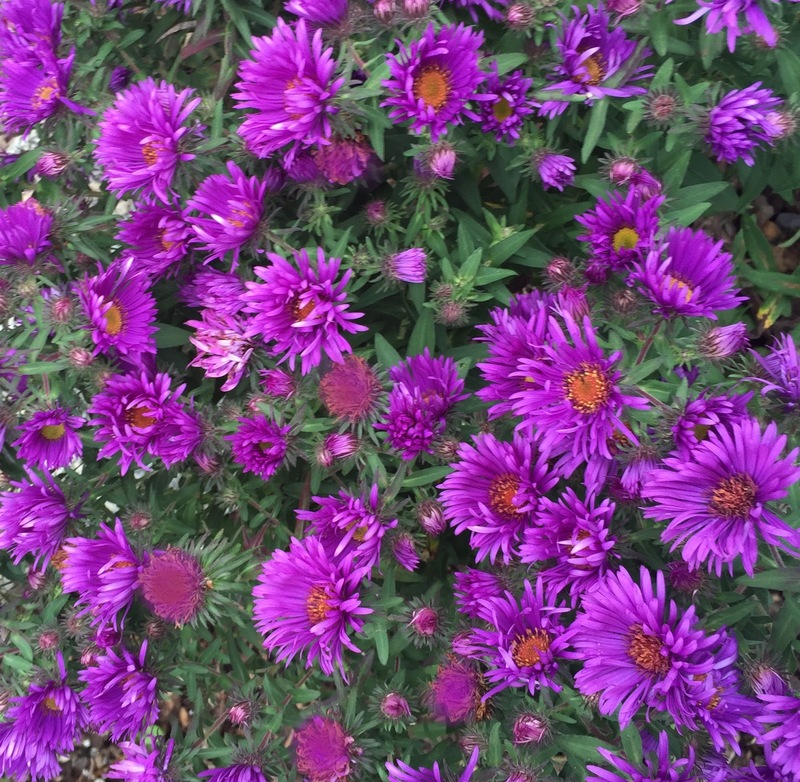 I think these are mums. I liked the bright colors, so I took a few pictures. Tonight I used Painter's digital pastel to do a little cleanup, and then cropped the image to get this composition. I saw these bright little flowers on Thursday, growing in a long row at Long Hill Gardens. I love the way they look so I took some pictures, but I don't know what kind of flowers they are. Anyway, tonight I cropped the original photo to get this composition. This is a photo that I took last week at Dane Street Beach, here in Beverly, MA. The morning had been foggy and if you look closely, you can see that the fog is still burning off. This photo turned out pretty well, straight out of my iPhone, but tonight I used iPhoto to crop it to get this composition. Here's another photo from last week's trip to see apple trees at Long Hill Gardens, here in Beverly, MA. 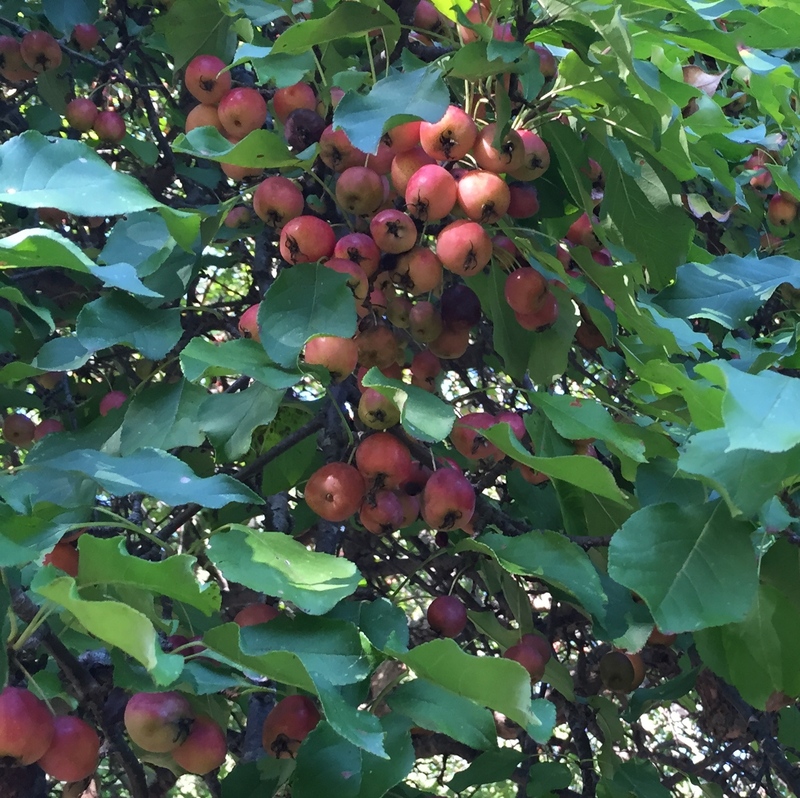 It was exciting to see all the apples, and so I took a lot of pictures. I cropped this image out of a larger photo because I liked the way the apples are clustered together on the branch. When I got the image into my computer, I could see that the leaves had been munched on -- and so had the apples! But I decided to try to salvage the image anyway. I used Painter's digital pastel to do some cleanup, and when I was finally finished, did some selective posterizing. This took longer than I wanted it to, but I think it was worth it. I might try to paint this as part of my "branches" series. Here are more crab apples from last week's walk at Long Hill Gardens. I did a bit of retouching on this one, but not much.